An optical telescope is a telescope that gathers and focuses light, mainly from the visible part of the electromagnetic spectrum, to create a magnified image for direct view, or to make a photograph, or to collect data through electronic image sensors. A telescope's light gathering power and ability to resolve small detail is directly related to the diameter (or aperture) of its objective (the primary lens or mirror that collects and focuses the light). The larger the objective, the more light the telescope collects and the finer detail it resolves. People use telescopes and binoculars for activities such as observational astronomy, ornithology, pilotage and reconnaissance, and watching sports or performance arts. The telescope is more a discovery of optical craftsmen than an invention of a scientist. The lens and the properties of refracting and reflecting light had been known since antiquity and theory on how they worked were developed by ancient Greek philosophers, preserved and expanded on in the medieval Islamic world, and had reached a significantly advanced state by the time of the telescope's invention in early modern Europe. But the most significant step cited in the invention of the telescope was the development of lens manufacture for spectacles, first in Venice and Florence in the thirteenth century, and later in the spectacle making centers in both the Netherlands and Germany. It is in the Netherlands in 1608 where the first recorded optical telescopes (refracting telescopes) appeared. The invention is credited to the spectacle makers Hans Lippershey and Zacharias Janssen in Middelburg, and the instrument-maker and optician Jacob Metius of Alkmaar. Galileo greatly improved on these designs the following year, and is generally credited as the first to use a telescope for astronomy. Galileo's telescope used Hans Lippershey's design of a convex objective lens and a concave eye lens, and this design is now called a Galilean telescope. Johannes Kepler proposed an improvement on the design that used a convex eyepiece, often called the Keplerian Telescope. The next big step in the development of refractors was the advent of the Achromatic lens in the early 18th century, which corrected the chromatic aberration in Keplerian telescopes up to that time—allowing for much shorter instruments with much larger objectives. For reflecting telescopes, which use a curved mirror in place of the objective lens, theory preceded practice. The theoretical basis for curved mirrors behaving similar to lenses was probably established by Alhazen, whose theories had been widely disseminated in Latin translations of his work. Soon after the invention of the refracting telescope Galileo, Giovanni Francesco Sagredo, and others, spurred on by their knowledge that curved mirrors had similar properties as lenses, discussed the idea of building a telescope using a mirror as the image forming objective. The potential advantages of using parabolic mirrors (primarily a reduction of spherical aberration with elimination of chromatic aberration) led to several proposed designs for reflecting telescopes, the most notable of which was published in 1663 by James Gregory and came to be called the Gregorian telescope, but no working models were built. Isaac Newton has been generally credited with constructing the first practical reflecting telescopes, the Newtonian telescope, in 1668 although due to their difficulty of construction and the poor performance of the speculum metal mirrors used it took over 100 years for reflectors to become popular. Many of the advances in reflecting telescopes included the perfection of parabolic mirror fabrication in the 18th century, silver coated glass mirrors in the 19th century, long-lasting aluminum coatings in the 20th century, segmented mirrors to allow larger diameters, and active optics to compensate for gravitational deformation. A mid-20th century innovation was catadioptric telescopes such as the Schmidt camera, which uses both a lens (corrector plate) and mirror as primary optical elements, mainly used for wide field imaging without spherical aberration. For specific designs of telescope, see Reflecting telescope, Refracting telescope, and Catadioptric. The basic scheme is that the primary light-gathering element the objective (1) (the convex lens or concave mirror used to gather the incoming light), focuses that light from the distant object (4) to a focal plane where it forms a real image (5). This image may be recorded or viewed through an eyepiece (2), which acts like a magnifying glass. The eye (3) then sees an inverted magnified virtual image (6) of the object. Schematic of a Keplerian refracting telescope. The arrow at (4) is a (notional) representation of the original image; the arrow at (5) is the inverted image at the focal plane; the arrow at (6) is the virtual image that forms in the viewer's visual sphere. The red rays produce the midpoint of the arrow; two other sets of rays (each black) produce its head and tail. Most telescope designs produce an inverted image at the focal plane; these are referred to as inverting telescopes. In fact, the image is both turned upside down and reversed left to right, so that altogether it is rotated by 180 degrees from the object orientation. In astronomical telescopes the rotated view is normally not corrected, since it does not affect how the telescope is used. However, a mirror diagonal is often used to place the eyepiece in a more convenient viewing location, and in that case the image is erect, but still reversed left to right. In terrestrial telescopes such as spotting scopes, monoculars and binoculars, prisms (e.g., Porro prisms) or a relay lens between objective and eyepiece are used to correct the image orientation. There are telescope designs that do not present an inverted image such as the Galilean refractor and the Gregorian reflector. These are referred to as erecting telescopes. Many types of telescope fold or divert the optical path with secondary or tertiary mirrors. These may be integral part of the optical design (Newtonian telescope, Cassegrain reflector or similar types), or may simply be used to place the eyepiece or detector at a more convenient position. Telescope designs may also use specially designed additional lenses or mirrors to improve image quality over a larger field of view. Design specifications relate to the characteristics of the telescope and how it performs optically. Several properties of the specifications may change with the equipment or accessories used with the telescope; such as Barlow lenses, star diagonals and eyepieces. These interchangeable accessories don't alter the specifications of the telescope, however they alter the way the telescopes properties function, typically magnification, apparent field of view (FOV) and actual field of view. The unit used in the object diameter results in the smallest resolvable features at that unit. In the above example they are approximated in kilometers resulting in the smallest resolvable Moon craters being 3.22 km in diameter. The Hubble Space Telescope has a primary mirror aperture of 2400 mm that provides a surface resolvability of Moon craters being 174.9 meters in diameter, or sunspots of 7365.2 km in diameter. Ignoring blurring of the image by turbulence in the atmosphere (atmospheric seeing) and optical imperfections of the telescope, the angular resolution of an optical telescope is determined by the diameter of the primary mirror or lens gathering the light (also termed its "aperture"). The equation shows that, all else being equal, the larger the aperture, the better the angular resolution. The resolution is not given by the maximum magnification (or "power") of a telescope. Telescopes marketed by giving high values of the maximum power often deliver poor images. For large ground-based telescopes, the resolution is limited by atmospheric seeing. This limit can be overcome by placing the telescopes above the atmosphere, e.g., on the summits of high mountains, on balloon and high-flying airplanes, or in space. Resolution limits can also be overcome by adaptive optics, speckle imaging or lucky imaging for ground-based telescopes. Recently, it has become practical to perform aperture synthesis with arrays of optical telescopes. Very high resolution images can be obtained with groups of widely spaced smaller telescopes, linked together by carefully controlled optical paths, but these interferometers can only be used for imaging bright objects such as stars or measuring the bright cores of active galaxies. or by the diameter of an aperture stop in the system. The focal length controls the field of view of the instrument and the scale of the image that is presented at the focal plane to an eyepiece, film plate, or CCD. Numerically large Focal ratios are said to be long or slow. Small numbers are short or fast. There are no sharp lines for determining when to use these terms, and an individual may consider their own standards of determination. Among contemporary astronomical telescopes, any telescope with a focal ratio slower (bigger number) than f/12 is generally considered slow, and any telescope with a focal ratio faster (smaller number) than f/6, is considered fast. Faster systems often have more optical aberrations away from the center of the field of view and are generally more demanding of eyepiece designs than slower ones. A fast system is often desired for practical purposes in astrophotography with the purpose of gathering more photons in a given time period than a slower system, allowing time lapsed photography to process the result faster. Wide-field telescopes (such as astrographs), are used to track satellites and asteroids, for cosmic-ray research, and for astronomical surveys of the sky. It is more difficult to reduce optical aberrations in telescopes with low f-ratio than in telescopes with larger f-ratio. , with an average adult having a pupil diameter of 7mm. Younger persons host larger diameters, typically said to be 9mm, as the diameter of the pupil decreases with age. of the two different apertures. For a survey of a given area, the field of view is just as important as raw light gathering power. Survey telescopes such as the Large Synoptic Survey Telescope try to maximize the product of mirror area and field of view (or etendue) rather than raw light gathering ability alone. The magnification through a telescope makes an object appear larger while limiting the FOV. Magnification is often misleading as the optical power of the telescope, its characteristic is the most misunderstood term used to describe the observable world. [clarification needed] At higher magnifications the image quality significantly reduces, usage of a Barlow lens increases the effective focal length of an optical system—multiplies image quality reduction. Similar minor effects may be present when using star diagonals, as light travels through a multitude of lenses that increase or decrease effective focal length. The quality of the image generally depends on the quality of the optics (lenses) and viewing conditions—not on magnification. Magnification itself is limited by optical characteristics. With any telescope or microscope, beyond a practical maximum magnification, the image looks bigger but shows no more detail. It occurs when the finest detail the instrument can resolve is magnified to match the finest detail the eye can see. Magnification beyond this maximum is sometimes called empty magnification. To get the most detail out of a telescope, it is critical to choose the right magnification for the object being observed. Some objects appear best at low power, some at high power, and many at a moderate magnification. There are two values for magnification, a minimum and maximum. A wider field of view eyepiece may be used to keep the same eyepiece focal length whilst providing the same magnification through the telescope. For a good quality telescope operating in good atmospheric conditions, the maximum usable magnification is limited by diffraction. (or diameter). The maximum is limited by the focal length of the eyepiece. used. The minimum often may not be reachable with some telescopes, a telescope with a very long focal length may require a longer-focal-length eyepiece than is possible. For small objects with low surface brightness (such as galaxies), use a moderate magnification. For small objects with high surface brightness (such as planetary nebulae), use a high magnification. For large objects regardless of surface brightness (such as diffuse nebulae), use low magnification, often in the range of minimum magnification. Only personal experience determines the best optimum magnifications for objects, relying on observational skills and seeing conditions. field of view is the extent of the observable world seen at any given moment, through an instrument (e.g., telescope or binoculars), or by naked eye. There are various expressions of field of view, being a specification of an eyepiece or a characteristic determined from and eyepiece and telescope combination. A physical limit derives from the combination where the FOV cannot be viewed larger than a defined maximum, due to diffraction of the optics. Apparent FOV is the observable world observed through an ocular eyepiece without insertion into a telescope. It is limited by the barrel size used in a telescope, generally with modern telescopes that being either 1.25 or 2 inches in diameter. A wider FOV may be used to achieve a more vast observable world given the same magnification compared with a smaller FOV without compromise to magnification. Note that increasing the FOV lowers surface brightness of an observed object, as the gathered light is spread over more area, in relative terms increasing the observing area proportionally lowers surface brightness dimming the observed object. Wide FOV eyepieces work best at low magnifications with large apertures, where the relative size of an object is viewed at higher comparative standards with minimal magnification giving an overall brighter image to begin with. converted from radian to degrees. There are many properties of optical telescopes and the complexity of observation using one can be a daunting task; experience and experimentation are the major contributors to understanding how to maximize one's observations. In practice, only two main properties of a telescope determine how observation differs: the focal length and aperture. These relate as to how the optical system views an object or range and how much light is gathered through an ocular eyepiece. Eyepieces further determine how the field of view and magnification of the observable world change. The observable world is what can be seen using a telescope. When viewing an object or range, the observer may use many different techniques. Understanding what can be viewed and how to view it depends on the field of view. Viewing an object at a size that fits entirely in the field of view is measured using the two telescope properties—focal length and aperture, with the inclusion of an ocular eyepiece with suitable focal length (or diameter). Comparing the observable world and the angular diameter of an object shows how much of the object we see. However, the relationship with the optical system may not result in high surface brightness. Celestial objects are often dim because of their vast distance, and detail may be limited by diffraction or unsuitable optical properties.
. The resulting true field of view is 0.64°, allowing an object such as the Orion nebula, which appears elliptical with an angular diameter of 65 × 60 arcminutes, to be viewable through the telescope in its entirety, where the whole of the nebula is within the observable world. Using methods such as this can greatly increase one's viewing potential ensuring the observable world can contain the entire object, or whether to increase or decrease magnification viewing the object in a different aspect. The surface brightness at such a magnification significantly reduces, resulting in a far dimmer appearance. A dimmer appearance results in less visual detail of the object. Details such as matter, rings, spiral arms, and gases may be completely hidden from the observer, giving a far less complete view of the object or range. Physics dictates that at the theoretical minimum magnification of the telescope, the surface brightness is at 100%. Practically, however, various factors prevent 100% brightness; these include telescope limitations (focal length, eyepiece focal length, etc.) and the age of the observer.
. A problematic instance may be apparent, achieving a theoretical surface brightness of 100%, as the required effective focal length of the optical system may require an eyepiece with too large a diameter.
. An eyepiece of 35 mm is a non-standard size and would not be purchasable; in this scenario to achieve 100% one would require a standard manufactured eyepiece size of 40 mm. As the eyepiece has a larger focal length than the minimum magnification, an abundance of wasted light is not received through the eyes.
. The limitation here is the pupil diameter; it's an unfortunate result and degrades with age. Some observable light loss is expected and decreasing the magnification cannot increase surface brightness once the system has reached its minimum usable magnification, hence why the term is referred to as usable. These eyes represent a scaled figure of the human eye where 15 px = 1 mm, they have a pupil diameter of 7 mm. Figure A has an exit pupil diameter of 14 mm, which for astronomy purposes results in a 75% loss of light. Figure B has an exit pupil of 6.4 mm, which allows the full 100% of observable light to be perceived by the observer. No telescope can form a perfect image. Even if a reflecting telescope could have a perfect mirror, or a refracting telescope could have a perfect lens, the effects of aperture diffraction are unavoidable. In reality, perfect mirrors and perfect lenses do not exist, so image aberrations in addition to aperture diffraction must be taken into account. Image aberrations can be broken down into two main classes, monochromatic, and polychromatic. In 1857, Philipp Ludwig von Seidel (1821–1896) decomposed the first order monochromatic aberrations into five constituent aberrations. They are now commonly referred to as the five Seidel Aberrations. The difference in focal length between paraxial rays and marginal rays, proportional to the square of the objective diameter. A defect by which points appear as comet-like asymmetrical patches of light with tails, which makes measurement very imprecise. Its magnitude is usually deduced from the optical sine theorem. The image of a point forms focal lines at the sagittal and tangental foci and in between (in the absence of coma) an elliptical shape. The Petzval field curvature means that the image, instead of lying in a plane, actually lies on a curved surface, described as hollow or round. This causes problems when a flat imaging device is used e.g., a photographic plate or CCD image sensor. Either barrel or pincushion, a radial distortion that must be corrected when combining multiple images (similar to stitching multiple photos into a panoramic photo). Optical defects are always listed in the above order, since this expresses their interdependence as first order aberrations via moves of the exit/entrance pupils. The first Seidel aberration, Spherical Aberration, is independent of the position of the exit pupil (as it is the same for axial and extra-axial pencils). The second, coma, changes as a function of pupil distance and spherical aberration, hence the well-known result that it is impossible to correct the coma in a lens free of spherical aberration by simply moving the pupil. Similar dependencies affect the remaining aberrations in the list. Longitudinal chromatic aberration: As with spherical aberration this is the same for axial and oblique pencils. Two of the four Unit Telescopes that make up the ESO's VLT, on a remote mountaintop, 2600 metres above sea level in the Chilean Atacama Desert. Optical telescopes have been used in astronomical research since the time of their invention in the early 17th century. Many types have been constructed over the years depending on the optical technology, such as refracting and reflecting, the nature of the light or object being imaged, and even where they are placed, such as space telescopes. Some are classified by the task they perform such as Solar telescopes. Light of different colors travels through a medium other than vacuum at different speeds. This causes chromatic aberration. There are technical difficulties involved in manufacturing and manipulating large-diameter lenses. One of them is that all real materials sag in gravity. A lens can only be held by its perimeter. A mirror, on the other hand, can be supported by the whole side opposite to its reflecting face. Most large research reflectors operate at different focal planes, depending on the type and size of the instrument being used. These including the prime focus of the main mirror, the cassegrain focus (light bounced back down behind the primary mirror), and even external to the telescope all together (such as the Nasmyth and coudé focus). A new era of telescope making was inaugurated by the Multiple Mirror Telescope (MMT), with a mirror composed of six segments synthesizing a mirror of 4.5 meters diameter. This has now been replaced by a single 6.5 m mirror. Its example was followed by the Keck telescopes with 10 m segmented mirrors. 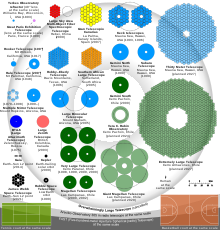 The largest current ground-based telescopes have a primary mirror of between 6 and 11 meters in diameter. In this generation of telescopes, the mirror is usually very thin, and is kept in an optimal shape by an array of actuators (see active optics). This technology has driven new designs for future telescopes with diameters of 30, 50 and even 100 meters. polarimeters, that detect light polarization. The phenomenon of optical diffraction sets a limit to the resolution and image quality that a telescope can achieve, which is the effective area of the Airy disc, which limits how close two such discs can be placed. This absolute limit is called the diffraction limit (and may be approximated by the Rayleigh criterion, Dawes limit or Sparrow's resolution limit). This limit depends on the wavelength of the studied light (so that the limit for red light comes much earlier than the limit for blue light) and on the diameter of the telescope mirror. This means that a telescope with a certain mirror diameter can theoretically resolve up to a certain limit at a certain wavelength. For conventional telescopes on Earth, the diffraction limit is not relevant for telescopes bigger than about 10 cm. Instead, the seeing, or blur caused by the atmosphere, sets the resolution limit. But in space, or if adaptive optics are used, then reaching the diffraction limit is sometimes possible. At this point, if greater resolution is needed at that wavelength, a wider mirror has to be built or aperture synthesis performed using an array of nearby telescopes. In recent years, a number of technologies to overcome the distortions caused by atmosphere on ground-based telescopes have been developed, with good results. See adaptive optics, speckle imaging and optical interferometry. ^ a b c d e "Telescope Formulae". SaharaSky Observatory. 3 July 2012. ^ a b c d e "Optical Formulae". Ryukyu Astronomy Club. 2 January 2012. ^ "Telescope Equations". RocketMime. 17 November 2012.